Sri Hanuman (Anjaneya) is a famous devotee of Lord Rama who is the personification of devotion, sacrifice, and dedication. 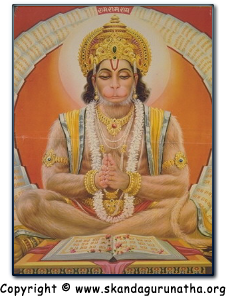 At the time of Lord Rama's coronation at Ayodhya, Hanuman asked Rama for a unique boon. He asked for eternal life on Earth so that he can serve mankind whenever they need Lord Rama's help in their lives. Hence, He is called Sankata Mochan or "the one who helps in times of peril." Apart from that, Lord Hanuman is also worshiped for health, removal of fear and especially as an antidote for all Saturn related troubles. May Sri Anjaneya's grace and protection be upon all those who recite this wonderful hymn. Note: For personal (spiritual) use only. Commercial use is strictly prohibited. Skandagurunatha.org wishes to gratefully acknowledge Kaumaram.org, ProjectMadurai.org, Raaga.com, Shaivam.org, Thevaaram.org, Sri Gopala Sundaram, Sri P.R. Ramachander, and Sri Siva Pa. Satgurunathar Desikar (Mayilaapur) for lending their talents to the preservation and propagation of these invaluable works. Your efforts are very much appreciated by us and all the devotees who frequent this website. You have our deepest gratitude, appreciation, and thanks! The audio (MP3) files & song lyrics (in PDF format) shown below are provided as tools to help you learn the important songs listed. They are not sung by professional singers and are thus, not meant for your listening pleasure  instead they are sung with love and devotion to God in the most basic rhythm (i.e. without the many 'aa-aa-aa's, 'na-na-na's, etc. heard from professional sangeetham singers). The primary objective is to help you quickly learn the songs so that you may reap its benefits (which are stated in the meanings of song) by chanting them. There is a common obstacle that some devotees face when trying to learn these sacred pathigams/stothrams  other experienced musicians discourage these devotees from learning these songs stating, "they must be sung with the proper rhythm, pan, thala, etc." If this premise were true, it would mean that God had ordained the original composers to bestow these sacred hymns only to musicians. However, this is not the case. Saints always are intent upon doing good to the world  as they are representatives of God on earth. Hence, God gave these sacred works for the spiritual upliftment of humanity as a whole  not for any particular group of individuals (i.e. musicians). Musicians aim to please the people who attend their performances, while devotees aim only to please God. Moreover, the only prerequisite expected of the devotee from God is true sincere devotion  not musical proficiency. Anyone who disagrees with this point can refer themselves to the study of the lives of The Sixty-three Nayanar Saints or obtain specific references in works listed stating otherwise. Learning to recite a scripture (be it Tamil or Sanskrit) can appear to be a daunting task for an ardent spiritual aspirant. Yet, the benefits of undertaking such a task and receiving God's blessings are undoubtebly worth the effort because the fruits of such efforts are infinite. The sacred compositions listed below, being Divinely inspired, have the ability to stir and vitalize the chakkras (energy centers) in the human body - allowing them to bloom like divine lotus flowers. This can be seen in Sri Arunagirinathar's Thiruppugal, "Jaya Jaya Aruna...," where the mere chanting of the sacred Siva Panchaaksharaa mantra (embedded in the song), has ability to activate and cause the chakkras in the body to become energized. For those whose native tongue is not Tamil or Sanskrit, you can follow this simple technique. Imagine that your chanting is like carving a beautiful moorthi (statue) of God (whatever form you hold near and dear). Visualize that the chants coming from your sacred lips are like a chisel hitting the stone and slowly sculpting an intricate and magnificent statue. As the pronunciation and studying improves, the beautiful form of the Divine will appear from the stone block. In fact, that is how pictures of deities were drawn. The holy rishis weren't artists, but they could see and hear the divine which they described with sounds, which formed the words and phrases of sacred slokas/pathigams. The meanings were expounded to artists who, based on their best approximation, drew an image of the deity. For those rare enlightened souls, the mere chanting of the sacred Tamil/Sanskrit works will allow them to see the image of the deity. Thus, the audio files below are given to help those interested sadhakas (spiritual aspirants) learn these works - namely their pronunciation and meaning - and reap their benefits. Please read the following as it contains important information to ensure that you can correctly open the files listed below. Many of the files listed are large in size (ranging from 1MB to over 20MB) and are only recommended for those with high-speed internet access. = this icon indicates that the file is an Adobe Acrobat PDF (portable document format) document. To view the file you must install Adobe Acrobat Reader (4.0 or higher). Click here to freely download the latest version of Adobe Acrobat reader. = indicates an MP3 audio file that can be played back on your computer. = indicates a picture file that can be viewed. = indicates a Youtube video file that can be viewed. Although extra effort has been taken to ensure that the files on this website are virus-free, it is not guaranteed. Any file downloaded from the Internet should always be re-scanned thoroughly before use. Skandagurunatha.org and its affiliated staff/webmaster, etc. will not be responsible for any damages caused by perusing any content from this website.